Today, we’re announcing that we are adding a new managed container service to our list of cloud services. The container service is now available to users as a complimentary service offered on our public, private, and hybrid cloud infrastructure. The container service is compatible with multiple container platforms — and we’re excited to announce that the first container platform to be supported is Kubernetes. The new managed service will allow users to quickly deploy Kubernetes container clusters with automated scripts. As of today, users can create up a cluster and start using it in a matter of minutes. Kubernetes is currently one of the world’s leading container orchestration framework. Kubernetes owes its success to being initially built by Google who has decades of experience managing containerized applications at a very large scale. Kubernetes is now run by the Cloud Native Computing Foundation (CNSF) as an open source project with a large active community. This ensures that the project is constantly being updated with new features that further simplify the deployment, scaling, and high availability of containerized applications. 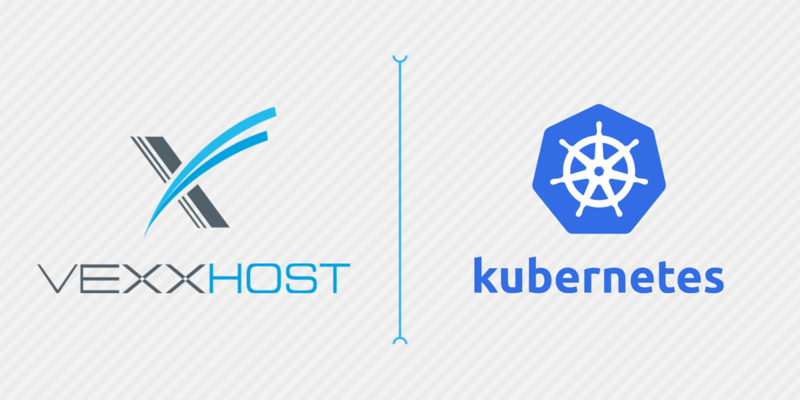 Why Kubernetes On VEXXHOST Infrastructure? VEXXHOST’s infrastructure-as-a-service (IaaS) offers public, private and hybrid cloud deployments. All our cloud services are offered on all three hosting models and Kubernetes container services are no different. Users will have access to our managed Kubernetes-as-a-Service offering across all our deployment platforms. As avid OpenStack users, contributors, and sponsors, we’ve ensured that our Kubernetes Service would work along with all our OpenStack services. The container service, which is powered by the OpenStack project Magnum, gives users the freedom of choosing between OpenStack and Kubernetes. In many cases, users might want to work with both OpenStack and Kubernetes to benefit from their respective advantages. In which case, they will be able to use both solutions in the same environment. We pride ourselves in the fact that all our infrastructure solutions are open sourced and have no vendor lock-in. Users can easily migrate their container workloads to anywhere Kubernetes is supported. By using open source solutions, users have the flexibility of taking over their Kubernetes cluster at any time. Knowing exactly what is happening ‘under the hood’ allows them to easily modify and configure the cluster if needed. Kubernetes container service is available to all users for free. Users can benefit from the fully managed service for free while only paying for the resource instances they require to create the container cluster. Instances are billed on an hourly basis with no long-term commitments. Here’s a quick guide to demonstrate how simple it is to create a Kubernetes cluster and access Kubernetes UI dashboard. To create a Kubernetes cluster, run the following command. Replace “my-cluster” with the name of your cluster. Replace “my-template” by the cluster template name. You can use “k8s-standard-8” to create an 8 cores, 8 GB cluster or use “k8s-standard-8-ha” for a high-availability 8 cores, 8 GB cluster. Use the high-availability template if you are creating a cluster with more than one master. Adjust “count 1” to reflect the number of masters and nodes you need. Request to create cluster xxxxxxxx-xxxx-xxxx-xxxx-xxxxxxxxxxxx has been accepted. Kubectl will handle the authentication and make your dashboard available at http://localhost:8001/ui. Make sure you have kubectl installed on your desktop in order to use this command. The UI can only be accessed from the machine where the command is executed.